The PMF Mach 12 Stainless Steel Wand is a super high quality Carpet Cleaning wand that will enhance your cleaning results while making your job easier. The 12" wide suction head and 1.5" down tube allow PMF's Mach 12 Stainless Steel wand to generate a balance of excellent vacuum, great soil recovery, with a modest weight. With a starting weight of just under 8 lbs, and very durable like all PMF wands, the Mach 12 Stainless Steel Wand just may be the most effective carpet cleaning wand in the 12 inch x 1.5 inch size category. PMF's entire Mach 12 Stainless Wand is made with the highest qualtiy components available to ensure years of trouble free and efficient service. 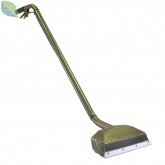 PMF even built the Mach 12 Stainless with flexible & ultra durable stainless steel solution lines! PMF's Mach 12 Stainless Steel Wand has 4 spray jets that blast cleaning solution as the perfect angle, moving soils across carpet fibers, rather than pressing them deeper within. Soils are loosened and left in a perfect position to be immediately extracted by the optimally designed 12" wide suction slot. The Mach 12 Stainless has a low profile head which slips right underneath low slung furniutre, eliminating the need to switch to a special tool. PMF's Mach 12 comes standard with Stainless Steel Glides but offers upgrades to Teflon Glides, the ultimate in reduced friction and relief from back strain! The Stainless Steel Mach 12's 1.5 inch Recovery Tube provides for a balance between good soil recovery, and reasonable weight. The perfect wand for portable extractors. The 4 Jet Adjustable Manifold along the 12" wide head allows for even, streak-free cleaning coverage and maximum conltrol over how the carpet cleaning solution gets applied to the carpet fibers. If your looking for an ultra effective, efficient, durable, light weight & high quality carpet cleaning wand, designed for portable extractor or truckmounted carpet cleaing perfection, you've found it with PMF's Mach 12 Stainless Steel Carpet Cleaning Wand! Does NOT include Brass Quick Connects. Please see available options drop-downs to add. Stainless Steel: This is the stock option that comes with the Mach 12 wand by default. 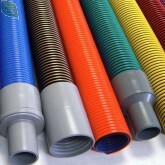 Includes two Standard Stainless Steel Glides, one for each lip. Teflon 'Tef' Glide: This is PMF's signature Low Friction "Teflon" Wand Glide. Greatest friction reduction, this glide will reduce your labor from 10% - 40% (depending on carpet type) compared to the standard SS glides. Note, the Teflon Glides can and do wear out with hard use. Please see option to add an additional Teflon Wand Glide below at an incredible price. This price only available when purchased with the wand. Includes two Teflon Glides. one for each wand lip. 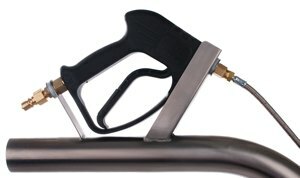 Quick Connect (required): This is the brass quick-connect that your high pressure solution hose will connect to near the handle of the wand. Please note that if you do not choose one here, your wand will not come with one. Simply select your chosen valve option to add this customization to your Mach 12 Wand order. 5000 psi Gun Style Valve: Rebuild kit for the guts of the GHP-5000 psi Gun Style Valve. Stainless Steel: This is the stock option that the PMF Mach 12 Wand comes with by default. Includes 2 standard SS Glides, one for each wand lip. Teflon (w/Adapter): Choose this option if you did not choose 'Teflon Wand Glides' under the required 'Wand Glide Type' drop-down above since you will need the adapter to attach the teflon glide to your Mach 12 Stainless Steel Wand. Includes two Teflon Glides, one for each wand lip, plus adapters to attach. Teflon (Glides Only): Choose this option if you chose 'Teflon Wand Glides' under the required 'Wand Glide Type' drop-down above as you will already have the adapter kit. Includes two Teflon Glides. one for each wand lip. No adapter. Inline Strainers: (Optional) These are simply extra strainers to replace or swap with the one already installed just before the Mach 12 Wand Valve. Being able to simply remove the clogged stainer and replace with a fresh new one can reduce down-time on-the-job, while you can clean, repair the removed one back at the shop. You can purchase in quantities of 1, 2 or 3 at time of Mach 12 Stainless Steel Wand Purchase. Low, however please be sure to attach vacuum hose to Mach 12 Carpet Cleaning Wand prior to turning on blower as children or pets risk injury if they come in contact with suction end of vacuum hose. As Stainless Steel is a fine conductor of electricity, while you & the cleaning tool are in contact with a wet surface you are at substantial risk of electrocution should you contact an a damaged power cord, or lightening strikes at or near your vehicle while you are carpet cleaning. Please use Caution! Check all power cords prior to cleaning for damage, and be sure to terminate all carpet cleaning operation during thunderstorms.